Meet Sally, our spacious, light and airy campervan who just loves being part of a family. She has 5 belted travel seats to keep you safe, a well-equipped kitchen to keep you fed, ​sociable facing sofas and great lighting options to suit your mood. Sally's layout is flexible and comfortable, making her a perfect home-from-home! She has an optional dining table that stores away on the back doors when not in use - it's great for playing games on too. Bunk beds are made up close to the cab, so when the little ones are tucked-up, the grown-ups can throw open the back doors and relax on the bench sofas, which easily turn into a comfy bed when the night draws in. Even when all the beds are made there's plenty of access to make that all-important cuppa! The fab internal lighting can be lowered, perfect when you don't want to disturb anyone who has fallen asleep early after a day of adventuring. She also has colour changing LED lights to bring more fun to your day. With being a little capsule home-from-home in a larger vehicle, Sally perfectly suits family campsites and offers lots of space at festivals. If you're planning a roadtrip - you may find one of our smaller and lighter campers more suitable. Please ask if you'd like more information. In addition to the bunk beds to the front and the double bed at the rear, Sally has room for a small free-standing cot, meaning she can sleep up to 5 (2 adults, 2 children and an infant internally). For more flexibility for sleeping and living areas we suggest you add the event shelter or pop-up tent. Sally has lots of panoramic windows so you can enjoy the beautiful views. At night, they are covered by blinds and curtains to help you get a great night's sleep. Sally has an L shaped kitchen with two gas hobs, a sink with running water and a 3-way fridge (12v, mains and gas). Her lighting can be powered from the leisure battery and she can be used both on and off grid. For periods longer than 3 nights, we recommend electric hook-up for optimum use. There's no excuse for clutter as valuable storage is available under the sofas, over the cab and in the above lockers around the living area. There's room for a free standing optional loo free-standing, that can fit under the bed. Don't worry about getting cold on your roadtrip, Sally will keep you warm with her blown-air heating. 2 electric sockets (on hook-up) and a USB charge point in the cab. Drive-away awning, outdoor furniture, BBQs, fire-pit, chemical loo and eco-loo, pop-up tents, gazebo, bedding and more. Additional mileage and gas cylinders can also be purchased. These can be added with our online booking or over the phone. View extras below. Using an electric hook-up at a campsite is recommended for optimum performance as it provides additional benefits such as 2 mains electric sockets for powering and recharging electrical items. We also have some home comforts you can user at no additional charge (but subject to availability, so please ask at time of booking!) such as a toaster, kettle, slow cooker and mini electric radiator. 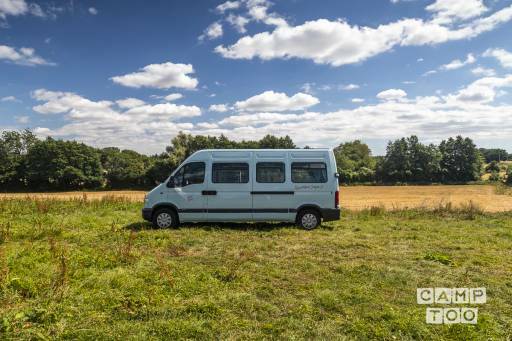 Sally is a campervan to rent from the Gloucester, Hereford and Worcester border and is perfect for your roadtrip adventure across the UK. UK rental only. No Smoking. Collection from 4pm. After 6pm late pick-up fee applies. Drop off at 11am. Possible to extend by prior arrangement and additional fee. Mileage included at 500 miles per week or pro rata. Additional mileage can be purchased at £40 per 500 thereafter. Insurance is included for UK/EU 2 drivers aged between 25-75 with a clean licence and at least 2 years' driving experience. There are exclusions for certain occupations, such as professional sports people and racers. Drivers from outside the UK/EU will need to be referred to the insurance company for approval. Drivers outside of these parameters may be possible with an additional premium, please ask prior to booking. Drivers will need to provide a valid driving licence upon collection, a DVLA check-code plus 2 items of identification (details sent with booking). In the unlikely event of breakdown, cover is included for your reassurance. Je kan de camper ophalen in Dymock bij Annah. Je kan je auto hier gratis parkeren.